Too often, lean expertise is confined within the four walls of a manufacturing operation. While there is a growing awareness of the continuity of the value stream from each supplier to each customer all the way to the final customer, breaking silos has not been easy. Robert Martichenko and Kevin von Grabe (Toyota alumni) founded the logistics company LeanCor to help their clients optimize their supply and fulfillment streams and make more money. Now they have authored a workbook-style tool, "Building a Lean Fulfillment Stream", published by the Lean Enterprise Institute, to help other companies see how that works. If it can do for the extended value stream what "Learning to See" and "Creating Continuous Flow" have done for inside the plant, the result could be dramatic indeed. The workbook format makes "Building a Lean Fulfillment Stream" an action guide. A company could go a long way by just following the recipe and working through the instructions. They are detailed, and explain a lot of whys and wherefores that a cross-functional team would need for a common understanding of the subject. The improvement process prescribed for the lean logistics team is orderly and logical, following flow from customer back through the manufacturer to the supplier. As you'd expect, the process includes a large-scale value-stream mapping exercise, and the workbook does a good job of explaining what information the participants must gather beforehand. The authors explain why each of those bits of data is important, and why some are different from traditional metrics. For example, inventory in its various locations is usually measured in dollars and efficiency evaluated in inventory turns. The book explains why calculating inventory in terms of the average number of days supply on-hand (ADOH) is going to be more useful, since that helps align takt time (cadence) from the customer's usage back through the system. At first, it would seem impossible to value-stream-map the thousands of parts and paths that would be found in the extended enterprise. In practice, however, it turns out that you can learn much of what you need to know by choosing one stable part used in one stable product. As concepts are learned through the workbook’s improvement process, they are tried out, assessed, then applied to more and more products to bring processes under control. The workbook provides a structure for analyzing the total cost of fulfillment in a way that management may not have seen it before, but also in a way that can make management sit up and take notice. At every stage, the team can calculate how it can affect the total cost and communicate the effort's value to leaders. The team can use the concept of total cost of fulfillment to illuminate the impact of decisions to offshore, re-shore, or never-shore. Looking at the 8 rights leads to a method for quantifying execution through all the phases of the logistics value stream and exposing the cold, hard reality that when you do the math and multiply the imperfect percentage scores across the stream, the good service you think you're providing could be more like 9% than the 90% your current metrics show. Although the workbook focuses on the single first pass of the value stream improvement process, it does address sustaining a continuous improvement approach. Although it's given only brief attention, it helps counter the impression some users might get from the simple workbook treatment that you can work through six chapters of a book and all will be done. The workbook lacks some simple features, like an index, that would have made it more useful to me. I skip over things as I read, then realize later that something was important, and I want to go back and re-read it. Without an index, I can waste a lot of time searching. A detailed table of contents and perhaps a glossary would be handy. All are "standard work" in textbook and professional book publishing that are being skipped too often these days. Fill-in-the-blank worksheets would be good tools for the team, both in the book for photocopying and online for customization and easy download. A single table showing the progression of total cost of fulfillment savings from one stage to the next compared to the current state shown after the first value stream mapping session would have made both a good overview of the improvement process and a capstone for summarizing the work the team has done. Small snapshots of the overall current and future state value stream maps in each section would help refresh the team on where its stage fits into the entire flow. That would continually reinforce stream thinking as the staged improvement process proceeds. The workbook format has an inherent limitation -- it can't include everything, and I don't think it should. It must simplify. Yet even with some exposure to lean logistics at LeanCor and Toyota, I found it a bit difficult to absorb all the ideas in the book, and members of a cross-functional team attacking problems will come to the project with different levels of knowledge. Some members of the core team should have broad, deep knowledge, and experience with lean and six sigma tools. A consultant to guide the process may also be necessary. Without that foundation, teams that just follow the workbook recipe are going to hit roadblocks and frustration, which can taint the process for years to come. The workbook doesn't make this need isn't made explicit in the workbook, and it doesn't provide a consolidated list of resources for delving more deeply into the subject. Once I started reading another book, "Lean Six Sigma Logistics" by Martichenko and Thomas Goldsby, the underlying mechanisms of traditional management of inventory and transportation as well as how to improve them with statistical analysis and lean principles became much clearer. I highly recommend making this book a companion to the workbook. Another source that will provide more detail and examples is "Toyota Supply Chain Management" by Ananth Iyer, Sridhar Seshadri, and Roy Vasher. (If you're a member of AME, you can read my article about lean logistics at the Toyota distribution center in Mansfield Massachusetts in an upcoming issue of Target magazine for a snapshot of how the company manages its supply of service parts to dealers. 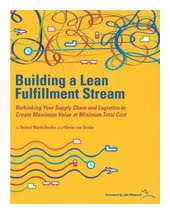 Overall, "Building a Lean Fulfillment Stream" ought to be in any lean leader's arsenal. It is authoritative, action-oriented, step-by-step, simple, timely, and results-focused. LEI is doing a great service by keeping its workbook series going, putting the means of improvement in the hands of the people who will do it. Karen, a terrific review here. Thanks for summarzing the content, challenges and supplements. A wonderful service to all of us. Alas, I have a copy of the book and it sits, pristine and unwrinkled on my desk corner (suitably not 5S-ed :-) ). You've given me an invite to dive in and wrinkle it up.